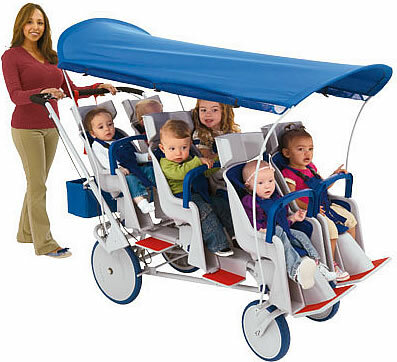 The RunAbout Buggy is the latest in multiple-child movers from Angeles. 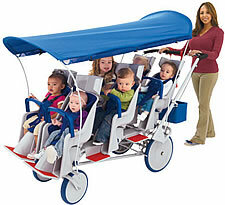 They have a modern design and a white and blue color theme (unlike the classic red Bye-Bye Buggies). 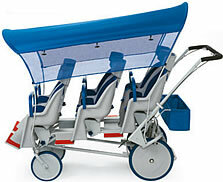 RunAbout Buggies are available in 6-seat models (see below). Frame Each frame is made from welded steel, then powder-coat painted. Seats The seats are made from soft, padded polystyrene foam. This makes them easily cleanable. Each seat covered with soft cotton fabric. The weight capacity for each seat is 40 pounds. Every seat reclines for comfort, up to 35 degrees. And the seating is staggered, giving every child a front-row seat. Every seat has a headrest, a five-point harness system, and a front “napping bar” in front. Tires The wheels swivel 360 degrees, to promote better steering. The tires have no air in them. Instead, they’re made from solid polyurethane. The wheels are spokeless. Steps There is a step next to each seat, in case the children are old enough to step up by themselves. Each step has treads on it, to help prevent slipping. Parking Brake There is a foot brake and a hand brake on every RunAbout Buggy. There is a commercial-grade secure parking brake and a secondary slow-down braking system. Steering The handlebar is padded. It can be raised and lowered from 36″ high up to 43″ high. There is also a foot push bar, to promote access to road curbs. Storage At the back of each buggy, below the handlebar, there is a fade-resistant storage compartment. It measures 26″ long x 7″ deep x 6-1/2″ high. Assembly The RunAbout Buggies require partial assembly (attach the handlebars and the canopy overhead). Warranty The RunAbout Buggies come with a 3-year warranty. Recommended Ages The RunAbout Buggies are recommended for children ages 6 months and above. Optional Items A storage cover is available for each buggy for $119.95. The covers are cut from fitted polyester. They are water resistant and color-stable. Color: blue. Phone us today for more information, toll free!